What happens when SPARTACUS meets VAMPIRES? Who are these ruthless humans? Who’s their brutal leader? And who betrayed the secret of the Blood Lifer world? London, Primrose Hill. Grayse is the commanding slaver’s daughter. She buys Light, like he’s a pair of designer shoes. So why does Light feel so drawn to her? Especially when his family is still in chains. Will he risk everything – even his new love – to save them? Does a chilling conspiracy lie behind it all? A stunning revelation leads Light to an inconceivable truth. To the dark heart of the Blood Club. If he can face his worst terrors, he can save his family and his whole species from slavery. Maybe he can even save himself. Escape into a supernatural world of love, revenge and redemption, where vampires are both predator and prey. There are three people in this affair…and two of them aren’t human. In a divided paranormal London, Light is the rebel bad boy vampire of the Blood Lifer world, with a photographic memory. And a Triton motorbike. Since Victorian times he’s hidden in the shadows with Ruby – a savage Elizabethan Blood Lifer. She burns with destructive love for Light. But he’s keeping a secret from her, which breaks every rule in Blood Life. When she discovers the truth, things take a terrifying turn. 1960s London. Kathy is a seductive singer. But she’s also human. Light knows his passion for her is reckless but he’s enchanted. Yet such a romance is forbidden. When the two worlds collide, it could mean the end. For both species. When Light discovers his ruthless family’s horrifying experiments, he questions whether he should be slaying or saving the humans he’s always feared. What dark revelations will Light reveal at the heart of the experiments? Will he be able to stop them in time? The consequences of failure are unimaginable. Unless Light plays the part of hero, he risks losing everything. Including the two women he loves. Blood Dragons is the explosive first installment of the new fantasy series Rebel Vampires from the critically acclaimed author Rosemary A Johns. Experience a thrilling new adventure with vampires, Rockers and dark romance. You grabbed my hand, dragging me after you down the warren of side streets behind the shops. It was pelting down now. Even though I was soaked, I was still buzzing from the barney. At last you stopped, shoving me up against a brick wall at the back entrance to a butcher’s. You pulled back (of course you bloody did), even if you were still clutching onto me, as if my body was yours. Because no matter what other nasties you might do with it, you’d never kiss your slave, would you? Then you suddenly hauled me closer, and we were snogging. At that moment, none of it meant anything. Slave or Mistress. First Lifer or Blood. It never does when skin meets skin. It was just Light and Grayse. So it was a good kiss. To me, it changed everything. But to you..? ‘If you would be so kind, some of us are trying to feed in peace.’ A nasal but polite Turkish Blood Lifer popped his nut up from further down the alley. He licked down the neck of a twitching First Lifer bird, who was propped up against a skip. When you shrieked and tried to jerk away, I held you still by the wrist. Your peepers were now flint. I started edging you backwards out of the shadows. Now wasn’t the time to give you a crash course on Blood Lifer dinner etiquette. ‘Parasites?’ I offered. You didn’t even have the decency to look away. ‘These are my streets,’ you tapped the sticky table for emphasis, in a boozer, street, postcode you’d never have ventured into, if it hadn’t been for me. ‘Right. Because I’d missed that.’ I took a mouthful of nuts, munching thoughtfully. You’d withdrawn hermit-crab like, your hair falling in two curtains over your mug. ‘There were humans once, who thought like you, the last time a Blood Lifer had the courage to reveal himself to a First Lifer. It was one of my ancestors. A man of reason, in an age of superstition. He reckoned our two species could live out in the open - side by side - so I was told. These First Lifers? They thought he was the devil.’ You’d raised your nut. I could see your peepers - dark grey now - through the veil of your hair. 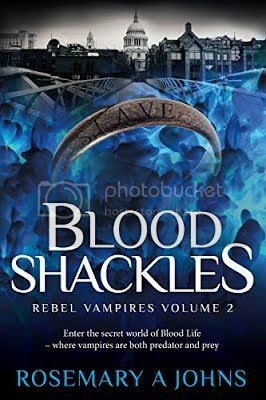 ROSEMARY A JOHNS is author of the bestselling Blood Dragons and Blood Shackles - the compelling Rebel Vampires series. Blood Renegades is released June 2017. ROSEMARY A JOHNS is a music fanatic and a lover of the anti-hero. She wrote her first fantasy novel at the age of ten, when she discovered the weird worlds inside her head were more exciting than double swimming. Since then she’s studied history at Oxford University, run a theatre company (her critically acclaimed plays have been described as "uncomfortable, unsettling and uneasily true to life"), and worked with disability charities.